Pretty simple card and quite flexible, though it might not be impactful enough to make it to a constructed deck. Compare it to Candleshot and you’re immediately underwhelmed. 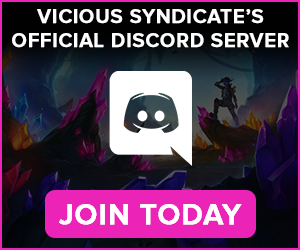 Needs synergy to get going but we’re skeptic about a Vereesa deck. Would have been great in Mage or Rogue. In Hunter, not so much. At least it hits face. Pretty good card with a deckbuilding restriction that’s not too difficult to pull off and is quite advantageous in a Mech deck. 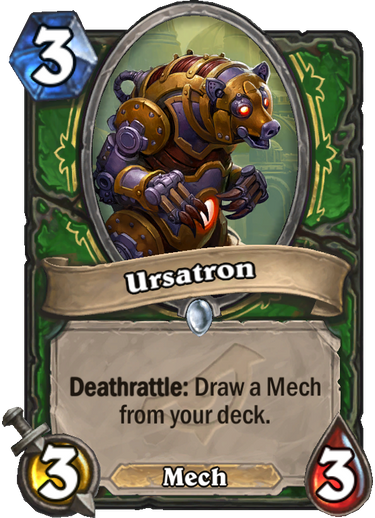 If Deathrattle Mech Hunter makes it to the meta, this is one of its most powerful enablers. The replacement for Flanking Strike in a Hunter deck’s curve. Granted, this card is nowhere near as good, because it doesn’t put anything on the board or generate a tempo swing. Still, discovering a spell is nice, and it has synergy with Zul’jin. Hunter could take whatever decent removal it can get. Another serviceable card that’s not outstanding. This card will likely see play because 1-mana beasts are highly sought after by the Hunter class. 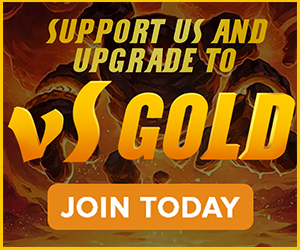 Promotes a beast deck that runs Zul’jin and Master’s Call. Hunter will play this until it finds something better than a worse Babbling Book. Do you want to cast a spell? I want to cast a spell! Hunter highly values comeback mechanics, and this card serves that role well. 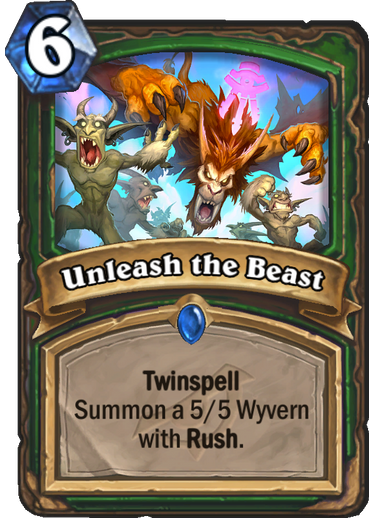 5/5 rush beast is very nice to have and being able to sequence it over two turns can help Hunter decks assert themselves in the mid-game. This card also has tremendous synergy with Zul’jin since it’s a spell that generates board (alongside value in hand), which is something that is sorely needed after the loss of Emerland Spellstone. The only problem with this card is that it competes with Savannah Highmane at the 6-mana slot. Both cards could be so important that they might still make it into a deck together. 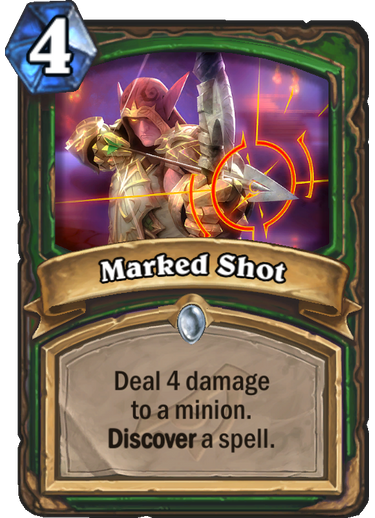 More card draw for Hunter? Sign us up. 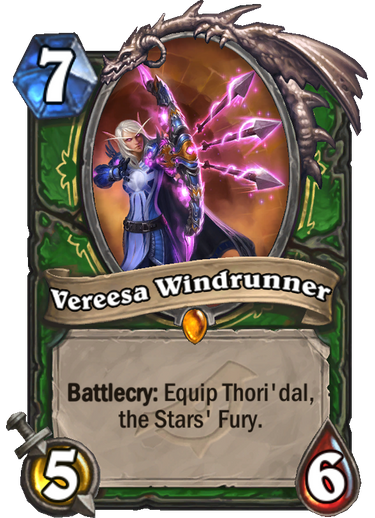 We like the synergy this card has with Master’s Call and think there’s a good reason to consider this card due to the departure of Deathstalker Rexxar. 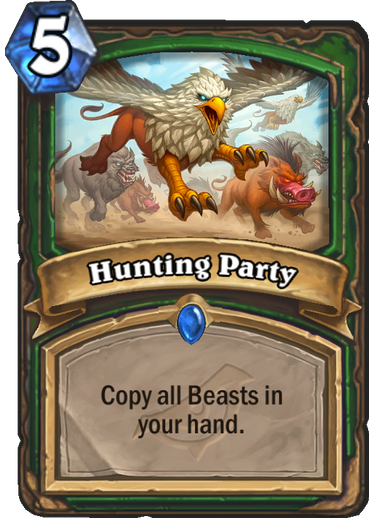 The problem with Hunting Party is that it’s very difficult for Hunter to spend so much mana on a card without developing a board, and you generally want to play your beasts rather than hold on to them for more value later. Might be a 1-of in Midrange Hunter lists and has synergy with Zul’jin. 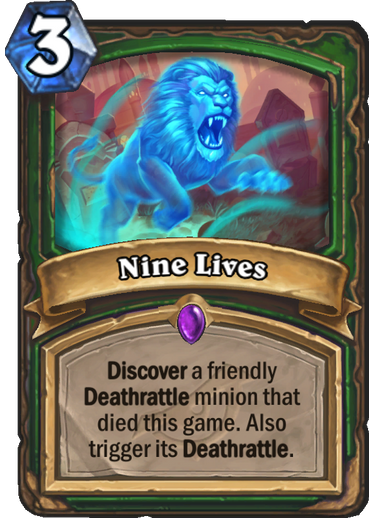 Nine Lives seems like a powerful card without a powerful deck to go with it. Most of Hunter’s deathrattle synergy will leave standard, and we’re questioning whether the high value deathrattles that will remain are worth building a deck around. 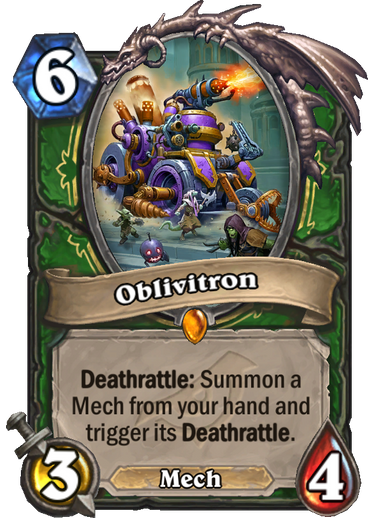 If Deathrattle Hunter makes a return, this card is a staple in the deck, and there’s a chance a Hunter deck will incorporate a small package of deathrattle minions to take advantage Nine Lives. 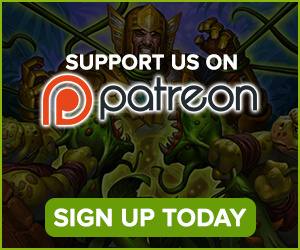 We really like the fact that after many years, Team 5 is now open to printing card draw for Hunter, and it has really helped the class step out of its one-dimensional playstyle. 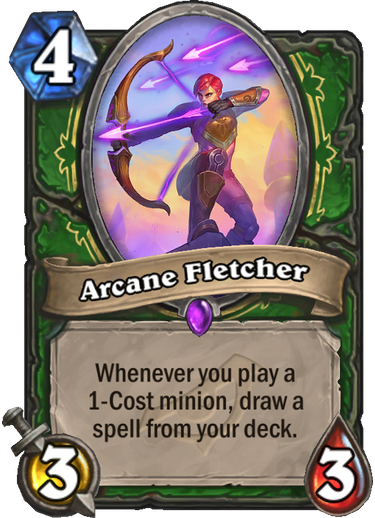 Arcane Fletcher is a nice card that synergizes particularly well with Springpaw and Halazzi and is clearly designed for a Hybrid Zul’jin deck. The problem is that it competes with Master’s Call and is much slower. That makes it a tough sell. Such a strangely specific card with very narrow use. 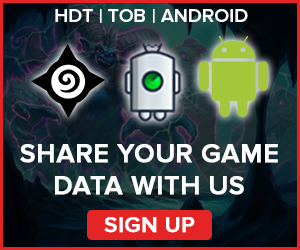 So, we want to play Mechanical Whelp, Spider Bomb, and… what else can we cheat out? Weaponized Pinata? Replicating Menace? We’re sorry Team 5 but you’re going to have to try harder, and even if you do, this card is so painfully slow that it may not make it to a Deathrattle Hunter deck even with more support. The little sister leaves a lot to be desired compared to her older sisters. This is a 7-mana card that doesn’t scream “game winning”. In the Hunter class, if you’re an expensive minion, you better do something very powerful. 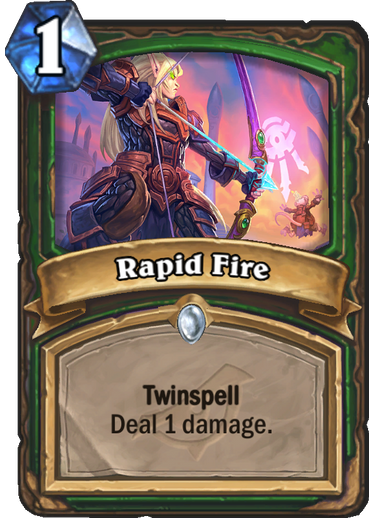 Sure, spell damage can be useful but Hunter’s access to burn doesn’t suggest it can realistically pew pew opponents like an Aggressive Mage deck. There are also not many removal cards that are playable and support this. Finally, we need a very good reason to drop Master’s Call, and Vereesa ain’t one. 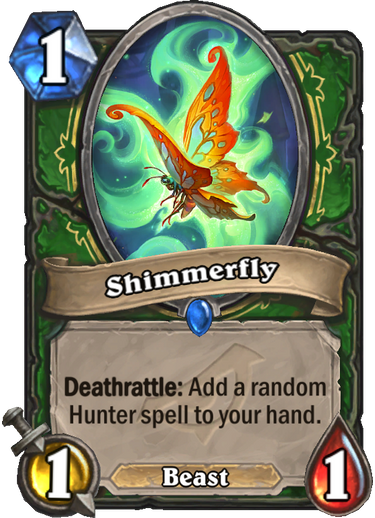 Hunter should significantly suffer from the upcoming rotation and the loss of some of its most powerful cards. Its Rise of Shadows set doesn’t seem to be strong enough to make up for these losses, and the most promising cards might need another expansion to truly shine. Expect Hunter’s days of dominance to be over.